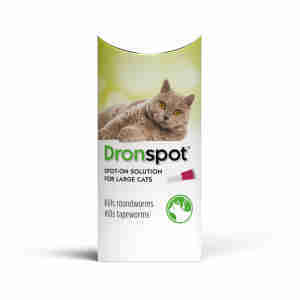 Dronspot is a spot on worming treatment for cats. Intestinal worms can easily be picked up by your cat from eating microscopic worm eggs from the environment, from hunting or from swallowing infected fleas when grooming. Kittens can even pick roundworms up from their mum when they suckle her milk. Dronspot takes the stress out of the worming routine. It’s a simple treatment that is applied at least once every three months to keep worms at bay. Fleas can spread tapeworms via their eggs so it is recommended that you routinely treat your cat for fleas to break the cycle. A spot on treatment such as Advantage 80 will treat and prevent fleas for up to 4 weeks. Do not use in known cases of hypersensitivity to the active substances or to any of the excipients. There is limited experience on the use of the product in sick and debilitated animals. Therefore the product should not be administered to these animals. Hold the pipette upright and twist off the top. Part the fur on your cat's neck at the base of the skull, until the skin is visible. Place the tip of the pipette onto the skin and squeeze until the entire contents has been released.